Here's where you can find us at Folk Alliance International Conference this week! Read about us below, or--> go straight to the SRSB website!! ...And it sure was worth the wait. Ryan and Betse have finally come together musically, bringing along Ryan's duo partner, Kelly Wells (The Aching Hearts from St. Louis) and Betse’s duo partner Clarke Wyatt (Betse & Clarke from Kansas City). 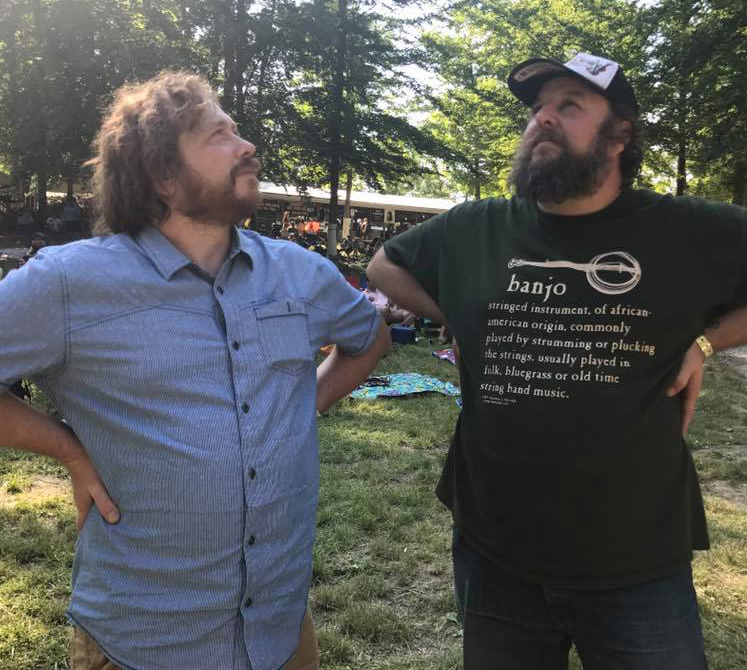 All night jam sessions, love of traditional music, and shared musical sensibilities turned into a special main-stage show at the 2017 John Hartford Memorial Festival, where the two duos performed together for the first time, highlighting the magical chemistry of those former bands in a new setting with two musical couples. 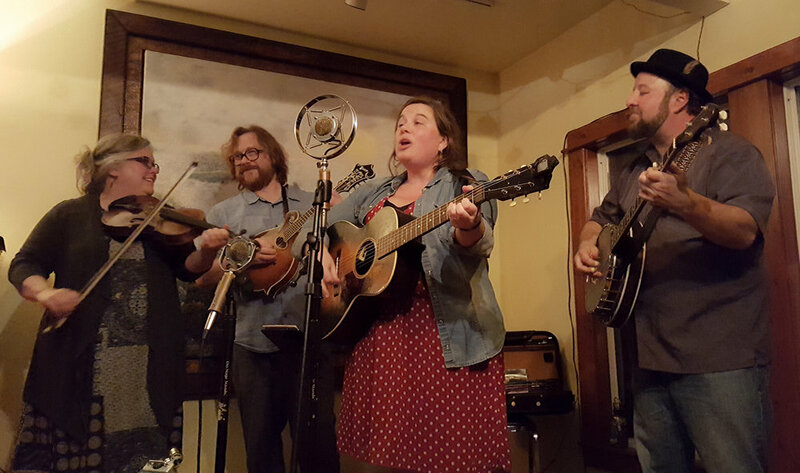 Members of the Short Round Stringband have collectively honed their craft and engage in multiple aspects of the folk music community. How many folk bands can boast an electroacoustic jazz composer trained in Paris, an executive director of a community radio station, 2 podcast producers, 2 radio DJs, 2 engineer/producers, 2 published ensemble composers, an online banjo lesson website, a multiple fiddle contest winner, 2 classically-trained instrumentalists, 4 folk music educators, 2 fiddlers, 2 banjo players, 3 mandolin players, 3 guitar players (and one tenor guitar player), 2 cellists, a violist, a harpist, and 4 inventive cooks? Short Round Stringband will release an album in early 2018, highlighting the powerhouse fiddling and singing of Betse Ellis, Ryan Spearman’s warm baritone singing and multiple instrument charms, Kelly Wells with her charismatic singing and guitar playing, and Clarke Wyatt’s deeply grounded and inventive finger-style banjo and guitar. Enjoy a glimpse into their rural retreat in the Spring of 2017! Here's "The Old Man at the Mill", a song learned from Clarence Ashley and The Dillards. 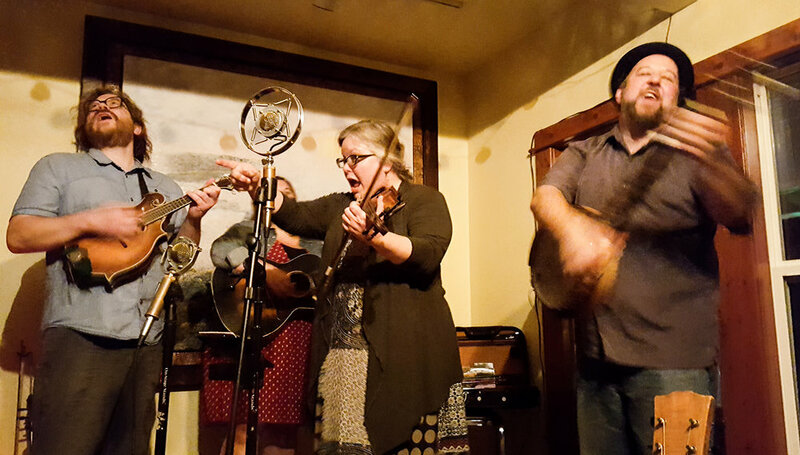 Short Round Stringband, founded 2017. 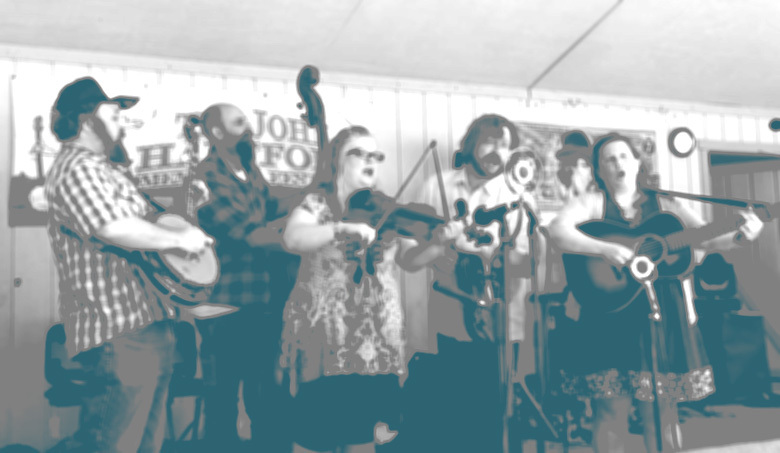 The band was featured on the Main Stage at The John Hartford Memorial Festival, May 2017. In December 2017, they played to enthusiastic audiences in Reeds Spring, Missouri, Fayetteville, Arkansas (where they received standing ovations), and Kansas City, Missouri. On December 30, 2017, SRSB will play a John Hartford Birthday Concert at The Stage at KDHX, St. Louis. Stay tuned for a SRSB website, and 2018 dates to be revealed soon!